Sunday, 20th May, 7.30 at Pedro Castle. The next viewing session will be on Sunday, 20th May, 7.30 at Pedro Castle. Saturday, the night before our viewing, look out for the moon and Venus, which will be very near each other, with the moon in a waxing crescent phase. Jupiter – the king of the planets – will be rising in the east at meeting time. Jupiter is the fourth brightest object to light up the heavens, after the sun, moon, and Venus. Saturn remains in Leo during May and will continue to form a small quadrilateral with Regulus and two other stars of the constellation. 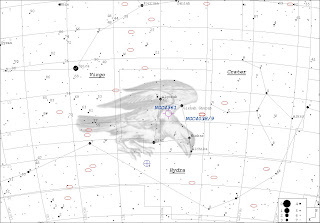 The constellation illustrated above is Corvus, the Crow or Raven, a very noticeable skewed box that crosses the sky just to the west of first magnitude Spica in Virgo. It has only 11 stars visible to the naked eye (brighter than magnitude 5.5), and can easily be seen in our southern sky. It was one of the 48 constellations listed by Ptolemy, and also counts among the 88 modern constellations. Although Corvus contains no Messier objects, you can see two objects labeled “NGC” on the picture. 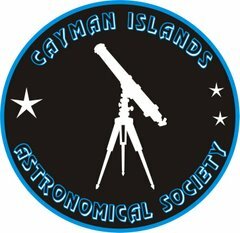 The New General Catalogue (NGC) is the best-known catalogue of deep sky objects in amateur astronomy. It contains nearly 8,000 objects, known as the NGC objects. The NGC is one of the largest comprehensive catalogues, as it includes all types of deep sky objects (not specialised to just galaxies for instance). NGC 4361 is a Planetary nebula. The nebula itself resembles a small elliptical galaxy, but the magnitude 13 center star gives away its true nature. They are in fact unrelated to planets; the name originates from a supposed similarity in appearance to giant planets. They are a relatively short-lived phenomenon, lasting a few tens of thousands of years, compared to a typical stellar lifetime of several billion years. About 1,500 are known to exist in the Milky Way Galaxy. NGC 4038/NGC 4039 are known as the Antennae Galaxies) are a pair of interacting galaxies. They were both discovered by Friedrich Wilhelm Herschel in 1785. As the two galaxies interact, billions of stars are born, mostly in groups and clusters of stars. The brightest and most compact of these are called super star clusters. Recent observations show that only about 10% of the newly formed super star clusters in the Antennae will live to see their ten millionth birthday. The vast majority of the super star clusters formed during this interaction will disperse, with the individual stars becoming part of the smooth background of the galaxy. It is however believed that about a hundred of the most massive clusters will survive to form regular globular clusters, similar to the globular clusters found in our own Milky Way galaxy. The two spiral galaxies started to merge together about 500 million years ago making the Antennae galaxies the nearest (at 63 million light years) and youngest example of a pair of colliding galaxies. Within 400 million years, the Antennae's nuclei will collide and become a single core with stars, gas, and dust around it. Observations and simulations of colliding galaxies suggest that the Antennae Galaxies will eventually form an elliptical galaxy. The Antennae galaxies take their name from the long antenna-like arms extending far out from the nuclei of the two galaxies, best seen by ground-based telescopes. These tidal tails were formed during the initial encounter of the galaxies some 500 million years ago. They give us a preview of what may happen when our Milky Way galaxy collides with the neighbouring Andromeda Galaxy about 6 billion years from now.